Five young men from Compton in downtown Los Angeles came together in the 1980s to form one of the most influential musical groups of the last 30 years and created N.W.A. This film deals with the forming of the group, the release of their controversial album Straight Outta Compton and the drama that followed the band during and after their short time together. How is it that most biopics feel like a Hallmark movie of the week? When it comes to this film I can’t help but feel that the gloss that has been painted onto the script, direction and acting at times does what 3d tends to do, it emotionally distances you from the experience. The over egging of moments to ‘move the crowd’ so to speak, usually does the opposite. We’ll call this the Hollywood effect. In 1988, when N.W.A. released their album Straight Outta Compton they lit a fuse that would change hip hop forever introducing the world to Gangsta rap, a kind of real life documentation of the streets that hit mainstream the way that Pimp by Iceberg Slim never did, it also being a documentation of L.A. street life. N.W.A. represented the streets who didn’t, at that time, have a platform. Ice Cube, Dr Dre, Eazy E, Mc Ren and DJ Yella kicked in the door waving their AK47s and demanded to be heard. At the time, what seemed to be a fad, gangster rap, would become one of the biggest money earners the music industry has seen in the 20th century and beyond. Switch on MTV and you will easily see the lineage all the way back to N.W.A.. Guns, drugs, women and lawlessness were rife in their lyrics and videos, after all they were writing and expressing themselves about their experiences of living in the ghetto. Parts of Compton in the 1980s were suffering with massive gang and drug problems. It had received little attention from the media; all that all changed with N.W.A.. Prior to the release of Straight Outta Compton, the Gangsta rap genre was alive but only available to the underground and those who kept their ears to the street. Schooly D and Ice T were pioneers of the sound but they weren’t as well known to the mainstream until the explosion that was N.W.A. happened. They reported the news from the streets as they lived it and gave voice to a previously maligned section of America, the ghetto. Through their music the group exposed police brutality to the mainstream public so when the Rodney King beating happened a few years later, many weren’t surprised. This film is one that demanded to be made, the story is important; bringing to the fore freedom of expression within music and for the uninitiated it may fill some blanks, albeit told with broad strokes, but for those who require more from film and its immense storytelling possibilities this is one to avoid. There is so much to fit into the two and a half hours that director F Gary Gray just can’t quite get the balance right in this composition. Too much time is wasted along the way and he fails to make this a tight piece of film that has all the right beats and notes. I would suggest you watch a documentary about the group to gain a more honest look at the world. It feels like certain scenes and events are smoothly rounded off and made more palatable for the audience. The five main actors do a good enough job but are not guided well enough to really create something with raw grit. Not their fault. Special mentions should go to Jason Mitchell who plays Eric ‘Eazy E’ Wright, his emotional journey is touched upon but within the confines of the Hallmark movie he has to work hard to make it work. Also, Aldis Hodge was great in the little he had to do playing MC Ren. R Marcos Taylor came close to capturing the psychotic Suge Knight and looks like an actor to watch out for. Paul Giamatti gives good Heller, playing their manager, seemingly out to exploit this incredible opportunity and screwing them over financially. But it’s nothing we haven’t seen before from him. He can play these parts in his sleep. It was always going to be the way that the characters of Cube, E and Dre would be featured much more heavily than Ren and Yella as their stories are more popular and recognizable to the public. After all, Ice Cube, Dre and Eazy’s wife, Tomica Woods-Wright were among the producers of this film. Like watching the shadow or reflection of the events it was depicting, a pale imitation, not once did I feel emotionally connected with the characters, a little bit like watching a bunch of actors trying desperately to recreate these events led by a director who didn’t have the chops to make it happen. 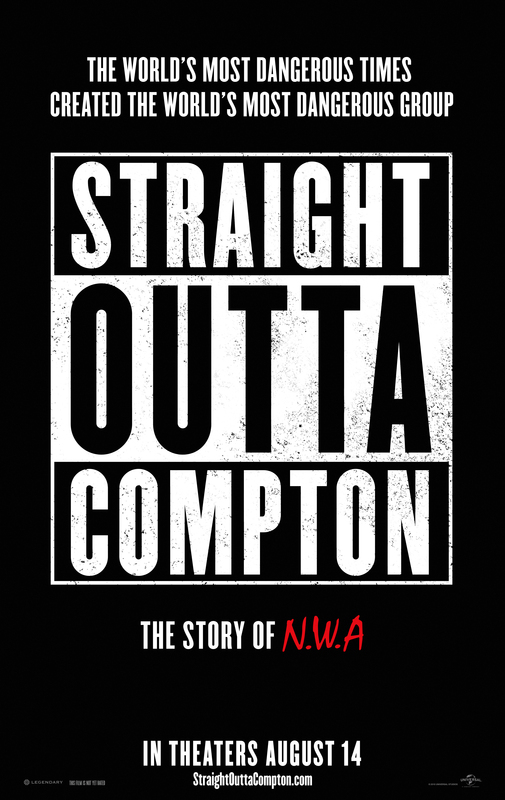 The biggest joy was the music, hearing it loud in a packed cinema was a buzz but it made me think of how much more I would be enjoying a straight up documentary about N.W.A. as opposed to a dramatisation. This film will make a lot of money, plenty of the multiplex crowd will be willing and happy to pay to see this story and that’s great, better that a film like this makes shitloads rather than a mindless blockbuster. At least it’s shedding a light on a time in our not too distant history even though the lamp is broken.